This scroll was commissioned for a new Aikido dojo. If you are interested in having a custom scroll made please view www.sales.customjapanesecalligraphy.com or email to sales@customjapanesecalligraphy.com. The top portion contains an Enso, and the bottom vertical writing says Nihon Goshin Aikidou. It is written in the semi-cursive, gyousho, japanese calligraphy style by Yoshimi "Ryugyoku" Maples. 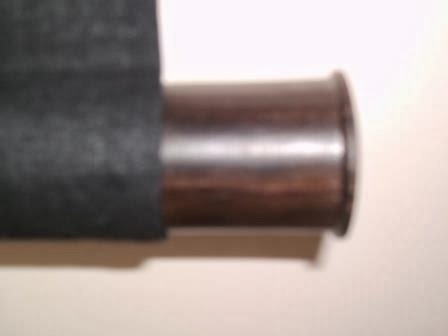 The customer requested a Fukuro Hyougu style scroll with a black cloth and red suji. It has an Ebony Enshu wood jikusaki (Kokutan Enshu) and light gold (usukin) hanging string. Now a question about the scroll. What is your thinking about introducing a "man" image in a scroll used for bonsai? Since traditional formal bonsai display in a Tokonoma (alchove) is based on three point concepts (Japanese Trilogy) of Man, Heaven and Earth. With the tree being "man" the scroll heaven and the accent earth, wouldn't a man in the scroll be redundent? I guess that would go back to the argument in my previous thread about differences between Keidou and Gadou display. Perhaps, Metaxis san studied under the Keidou style...I have never met her, but heard many good things about her knowledge of display. I am travelling at the moment and do not have access to my files or books, but I remember two examples of displays in the Gaddou book that utilize travelers/person in the scrolls of the display...Also, nowhere in the Gadou kyouhon (teaching books) have I ever come across reading about the Man, Heaven, Earth idea...(Not saying that it does not exist in Gadou...but I have not come across it) When I get back and have time I will try to show those displays and translate meanings. I promised some displays with scrolls that have man images in them. Here is one. The original display is on the left and the critiqued display redone is on the right. Translation by myself is attached. I was born in Shiga Ken, and I became acquainted with the scenery around lake Biwa (Biwako) It was a joyful place to play among the reeds near the lakeside. Protections and preservation of the lakeshore is continuing, but due to drainage and development the water quality has declined and pollution has reduced the number of reeds around the shoreline, lessening the beauty of the scenery. This display was created from a childhood scene etched in my memory. Viewing from the reeeds, I could see a fisherman in the far distance. It was a late winter that year, but the anticipation of spring was at the door, so the reeds were still dry but ready to blossom for spring. It made me think of the following poem.比良八荒荒れ仕舞 Hirahakko Are Shimai The end of the storm that brings the cold wind in February on Lake Biwa. In order to complete the scene with the standing dry reeds, I used a wallscroll with a fisherman and a long formal rectangular lacquered jiita to give the impression of the viewer of seeing this from the lakeshore. The plan of using this jiita was probably a little too hard, but I thought it would work. Always Sensei’s advice is to have a scroll that transports one into the scene. Use of thin objects is best and become transparent to the viewer. With the standing reeds as the main object, I think it achieved a more than elegant taste. In displaying with Shouhin it takes a playful heart and you can display with inexpensive pieces. These qualities also allows the layperson to have a chance at using their heart to display their story. However, elegant displays attach themselves to the foundation but stops short of conceitedness. It has a hint of spirit in the display. Not just the tree or grass plantings or pot, but all the elements of the tools and the artisans work is in the display to create the entire spirit of atmosphere. Because of that one must have understanding, touch, and joy in the heart to create a display. I want to have the heart to share my display so that others will have a spring of joy come to them and a deeper appreciation of nature. This Seki Kazari does an excellent job of telling the intentions of the scene, however, the main planting I feel screams a little bit of impudence, haughtiness or is uncharacteristic. Almost all grass plantings dry out from the fall to winter, and because it is common, but shows good workmanship for the look necessary for the Sanyasou. Using the original jiita for the lake shoreline was OK, but it does not convey the feeling of cold that is associated with the cold wind storm in February, nor does it match the painting. This type of jiita seems to step on the excellent display of the stalks of reeds. The miginagare hidarikatte setup concentrates the display, and expands it in the inner working of having a sense of semi formal. The lines of the rectangle jiita are too strong, and this jiita would work better for a summer scene. Also by changing this into a suiban and using a natural shaped jiita, the display becomes more settled. By making these changes, it gives consideration and attention and the display is abbreviated and simplified. I recently wrote a long post on a bonsai forum about some of the different display schools in Japan that I am aware of for bonsai. Here are some excerpts of that post. is there a resource I may turn to which discusses displays styles? I have spent an exhaustive amount of time looking for this information but have found a lot of convoluted information out there. I wanted to spend this post explaining my feelings and experiences with display. Initially, when I read some articles on display from Golden Statements or other sources I was also utterly confused. So I did a search to find information on displaying bonsai formally in a Toko no Ma or a Seki Kazari. What I learned is that there are many different organizations or schools of thought promoted by individuals. In a personal discussion with Mr. Shimazu from CA at the 2011 GSBF convention he stated he did not like display in general because it was so much based on the individual that was promoting their way of doing something. I still felt I needed to be more in tune with what a bonsai artist may want in a scroll that I still pursued learning about it on my own. The two main display organizations I was able to learn about were Keidou and Gaddou (景道・雅道） According to my understanding, Keidou was founded by a Mr. Uhaku Sudou [It was clarified that Mr. Ichiu Katayama is the actual founder of Keidou]...and Gadou which actually traces it's lineage to concepts of Keidou by a Mr. Ichiu Katayama [It was clarified that Mr. Ichiu Yamamoto is the founder of Gadou]. It is also my understanding that Keidou is no longer actively taught as a display style in Japan. I think that is the first point individuals studying display need to be aware of, is that there is also conflicting ideas about what rules should be applied for a display within Japan, and certain characteristics or ways of doing will be promoted or encouraged depending on the display style. Keidou principles/ideals have benefited greatly from some very notable and talented US bonsai/Suiseki professionals going over and learning directly from the founders of their system. So many people have nuggets of wisdom to disseminate. My second point is that is exactly why to me there is convoluted information. No one has actually taken the time to concisely and clearly consolidate these display guidelines into a book with step by step instructions on how to organize a display. I also consider this a problem with the Lost in Translation concept. You know the movie, director screaming because the actor's emotion is not correct, changes it after being told and yet still not correct in the hundreds of retakes...What one person heard in Japan that is a set in stone rule, may actually be a general guideline that is encouraged and not actually practiced in every display...and vice versa. What is the reason for creating a formal display? I guess the answer would vary depending on the circumstance. Contests? shows? Notoriety? This is my third point is that very few bonsai artists in the US just create a display just for the fun of it and for their own individual pleasure...So few displays created that when one comes up it is critiqued 'ad nauseum' with all the "rules" that we may or may not know that now this person is discouraged from ever setting up another formal display ever again. Have fun, do it often and enjoy it. 1. It always starts with the tree. This is not about having the most refined showstopping bonsai, this is about having the correct species of tree with the correct styling that is the focal point of an overall story or scene in nature. 2. Define the formality of first the species and styling of the tree and then blend every other piece (pot, stand/jiita, accent, scroll) to complement that ranking definition. Two children & a Wonderful Wife.